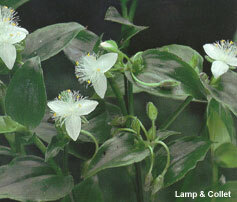 Growth Habit: Wandering Jew is an aggressive scrambling creeper that can smother other plants as it forms a mat-like cover of the ground it occupies. It has smooth, dark green leaves. Type of Plant: Sprawling, fleshy, perennial plant that may also produce erect stems. Flowers: Small, white three petalled flowers which appear in summer in clusters at the end of the stems. These flowers have yellow tipped stamens. Dispersal: It has trailing succulent stems which root at the nodes and form new plants. It can also reproduce from stem fragments broken from the parent plant. Distribution: A garden escapee which thrives in moist, shady places. It competes with other species as it dominates the soil surface. Well known to cause allergic reactions to dogs. Grubbing. Take care to remove entire plant. To dispose, burn or place in a heavy-duty plastic bag and seal. Do not dump as this plant can reroot after initial removal and can cause serious problems in natural areas. Herbicide. Spot spray. Herbicides registered in Tasmania include metsulfuron and glyphosate.